I am self taught and work in acrylic. Most of my paintings are based on my observations of people and reflect my day to day life - at home with the family, commuting to and from London, using the tube, working in an office. Body shapes and expressions fascinate me. I am interested in compositions involving a number of people - the tube and commuting gives me a lot of inspiration for this. 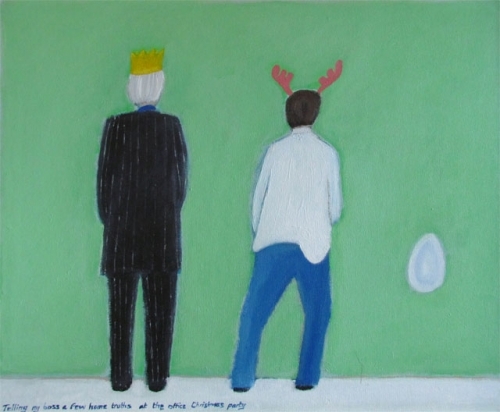 I try and look for a humourous element in these paintings - a situation which can be identified with and related to. To convey this idea I have found that the title is often particularly important. If the title strikes a chord it really enhances the image. In addition to these "people" paintings I am also very interested in still life painting. This is principally from the point of view of trying to make colours work together and harmonise. If that balance is achieved I think the painting has a tremendous impact. and really holds the eye.